A hideabed is all about bringing comfort and convenience together. You want a cozy and relaxing bed for your house guests or even yourself to sleep on, but you also need to tuck it away, seeing as you don’t have enough space for it. Hideabeds do just that. However, to maximize their benefits, you need to choose the perfect one. How do you do that? Take a look at our guide, as we’ve made things simple for you. Do you need a sleeper sofa? This question might seem a bit redundant now that you’ve made up your mind to buy a hideabed. Still, you need to think about it carefully because it’s quite an investment. Sleeper sofas are by no means cheap. They’re actually a lot more expensive than a regular sofa, and their price keeps on increasing if you add back support, a comfortable enough mattress, and a sturdy frame. Therefore, if you’re buying the sleeper sofa out of a whim or ‘just in case’ a friend from out of town or a great aunt comes over, think again. You are far better off with an air mattress which you can keep in your closet. If you are buying it for actual, regular sleeping, then you have a good enough reason. Apart from all this, purchasing a hideabed for guests is not an easy task to do. When you’re buying sleeping supplies for yourself, then you know what your body requirements are, but when shopping for strangers, it gets complicated. Firmer mattresses may be better for elderly people as they like the extra support and seeing as it helps them climb out of bed. Younger people often prefer softer sofas, and it’s on you to find a way to please them all. What size should the sofa bed be? To determine this, you need first to decide where you’re going to place the sofa itself and then measure that area. You can figure out what exact width it should have. Seeing as hideabeds usually come in 4 standard widths, it will be easier to choose while in the store. 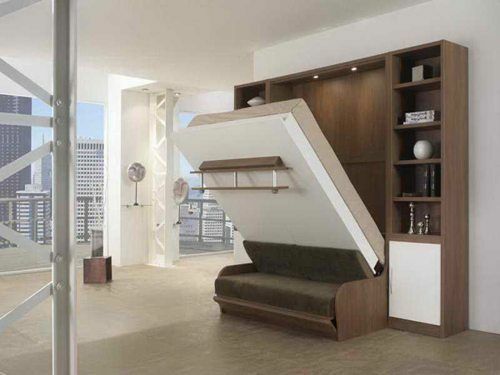 Will the murphy bed fit through your doors? Another set of measurements you must perform prior to heading out shopping revolves around your doors and ceiling height. Measure exactly how high your rooms are, as you may very well have to turn the sofa bed on its side to carry it to its final destination. Apart from that, you need to measure all the doors it will have to fit through. Mismeasurements are a common mistake people make when it comes to moving furniture. They realize they have to do it, but only think about the door of the room the sofa is supposed to go in. But you needn’t forget about all the other doors, including the main door into the apartment or house and the door of the building you live in. Measure the width of your elevator, to see if you can use it or how narrow your staircase is, in case the elevator is not an option. Most futons have the same type of structure, seeing as their mechanisms are similar and made by the same manufacturer. This likeness means there is a tiny difference from one brand to another, and this is excellent news for you. You can choose any brand you want. Normally, any hideabed has a metal frame surrounded by coils which hold the canvas decking. In the past, sectional sofa beds were notorious for the metal bar underneath the mattress which made it almost impossible to sleep on without waking up to severe back pains. Nowadays, however, while the best part of futons still has the infamous metal bar, it curves away from the body, eliminating any risk of sore backs. There is one exception, though, about which you should know. American Leather/American Upholstery produces one particular line of sofas that have a wooden base under the mattress. It’s a system that allows for its pairing with a normal-sized mattress while taking up less space when the sofa opens. Since the mechanism is the same for almost all the hideabeds out there, the mattress is the actual element that makes a difference. It’s rather unlike any of the other conventional sofas, mainly because it needs to fold. There are three types of mattresses designed for a hideabed. Innerspring mattresses – exactly as the name suggests, they have springs on the inside. 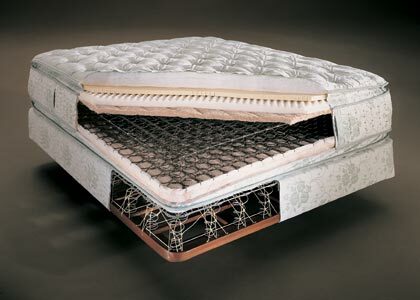 When it comes to springs, you should always check the technical description of the mattress and chose the one which has the higher number of springs. If the count goes as high as 600 or 650, it will be an excellent mattress. Memory foam mattresses – are an innovation and are considered to be better than the classic springy ones. Apart from that, they have body memory, which means they will conform to the sleeper’s body and positions. Air-coil mattresses – these mattresses represent the best of both worlds, so to say. They have inner springs as well as an air mattress on top of that. After you’ve done all the routine preparations obligatory prior to purchasing a hideabed, you should also research some tips and tricks that will help you get a great deal and a great couch. Most people shy away from testing a mattress, but it shouldn’t be like that. You should, in all seriousness, lay down on the bed right there in the store and test out different sleeping positions. You have every right to do so, as this is quite the investment you’re making and your friends and family will have to sleep on it for a long time. You can do this by simply folding and unfolding the bed several times over. See if this is something that will be easy for you to do and not something you will have to struggle with. You can also sit down on the sofa after you folded it, so you can test how it feels when it will act as a regular couch in your house. As pointed out all the long of this article, there are a lot of things to take into consideration before buying a sofa. If you speed the process along or decide to buy a futon a few days before your cousin comes to town, you will be stuck with whatever they have on the showroom floor at your local furniture store or Walmart, for example. Get a head start so you can indeed make the best choice. You can also get it custom designed in your preferred fabric and color. One excellent piece of advice is to be on the lookout for clearance items. A sofa that converts into a bed is pricey and any discount you can get, no matter how small, is welcomed. In case you do manage to get a discount on sleepers or any sofa-bed for that matter, you can use the money to customize it. For example, you can change the chaise by turning the covers into suede. A modern, large suede lounger that turns into a bed will allow your guests to sleep like kings. How many restless nights have you spent on one of your friend’s bad hideabeds? Probably quite a few. In this case, you should already know how important it is to make the right decision and buy the perfect one.